Colonel Ed Rutty commanded Marine Aircraft Group Twelve in 1971-1972. The Air Group had two A-4 Skyhawk squadrons and one A-6 Intruder squadron. The Group was located at MCAS Iwakuni, Japan and had been assigned a SIOP role. Colonel Rutty ordered me to take command of the A-6 squadron VMA(AW)533 on October 1, 1971 and to get the airplanes and air crews ready for their SIOP role ASAP. I proceeded to Naha, Okinawa and assumed command of the Night Hawks. To explain how the Air Wing Commander, Major General Robert G Owens, could allow a Major as CO of an A-6 squadron instead of a Lieutenant Colonel, who had never been to the A-6 NAMTRADET training and who had never even sat in an A-6 Intruder or an A-6 Simulator, one has to look at my background at the time. I had close to a thousand hours in the Half Cuban Eight practice bombing pattern for delivery of nuclear weapons. I had held a nuclear delivery pilot military occupational specialty designation for 14 years earned in A-1 Skyraiders and A-4 Skyhawk aircraft. And, I had over five thousand hours in single engine-single pilot fighter / attack aircraft. Group Skipper Rutty asked if I wanted command of a squadron and my answer was emphatically "Yes!" Colonel Rutty then said, "Go to Naha and take command of the 533rd heavy bombardment squadron and get those aircraft operational!" Rutty, who always referred to the A-6 squadron as the "Five hundred and thirty-third Heavy Bombardment Squadron", had served an exchange tour with the Air Force. Upon assuming command at Naha, I set the new policy of getting all the A-6 airframes operationally flyable and then work on full systems capability while flying Half Cuban Eights at the nuke delivery practice targets. The Aircraft Maintenance Department under Major Bobby G. Rutledge quickly got the Aircraft operationally ready and the full mission capability improved rapidly. During the same time period, the pilot and bombardier flight crews were constantly working on their assigned targets folders, planning methods of delivery and perfecting entrance and exit strategies. The crews rapidly became operationally ready for actual nuclear weapons delivery if and when required. As each aircrew became weapons delivery designated, I was required to call each pilot and Bombardier/Navigator into my office individually and require him to sign a certification and swear that he would have no reservations about dropping a nuclear device whenever, wherever and on whatever the United States ordered him. My recall is that the mandatory procedure was titled "Reliability Screening." About half of the flight crews had signed the oath when Captain Leonard Robertson came into my office for certification. When I began administering the oath, Lenny said, "Sir, I cannot in good conscience bring myself to drop a nuclear bomb on any target because of the collateral damage to innocent people." The statement caught me by surprise. I stopped the procedure and asked Captain Robertson to sit down and explain his reasons for refusing to follow such an important order. Captain Robertson explained at great length why he held his refusal position. After a half hour of talking to Lenny, I realized the Marine pilot was steadfast in his refusal. I had a big problem. I called Colonel Rutty the next morning and requested an immediate replacement A-6 Intruder pilot to keep the target and air crew assignments filled for execution of our SIOP mission. Rutty called back in a couple of hours. His answer was, "No qualified replacement exists at MCAS Iwakuni. You must keep pressuring him and break down his resolve not to fly as ordered." Lenny was brought into my office every day for an hour and we discussed his views and mindset on dropping the "really big one." I had my Executive Officer, Major Andy Martin counsel Lenny each day. I had the Chaplain try to ease Lenny's worries about inflicting civilian casualties. My last couple of sessions involved me trying to convince Lenny that a full load of five, two thousand pound general purpose bombs or thirty, five hundred pound bombs could inflict substantial collateral damage to civilians any time such a conventional load of bombs was dropped from an A-6. And, I told him that since he was ready to do that every day, he had already resolved that civilians were fairly safe in that non nuclear scenario. Therefore, if it was all right to drop ten to fifteen thousand pounds of bombs on a target, why not drop a ten kiloton bomb on a target? Perhaps it was the comparable target versus ordnance size argument that brought Captain Robertson to yield to counsel or was it just to stop the daily sessions of defending his adverse position to Marine Corps policy? Or maybe his warrior contemporaries convinced him that the bomb had to be dropped by someone when the time came and it might as well be him. Whatever the reason, after a week Lenny told me he was ready to sign the certification. That was a relief to me and those in leadership up the Chain of Command. Six months after the affirmation problem with Lenny Robertson, the VMA(AW)533 SIOP commitment was cancelled, I was relieved as Commanding Officer by Lieutenant Colonel Jim Brown on June 17, 1972 and the squadron was transferred into Nam Phong, Thailand for conventional warfare operations against the North Vietnamese Communists. VMA(AW)533 combat operations commenced immediately at Nam Phong [commonly referred to as "The Rose Garden" by Marines]. The Night Hawks of VMA(AW)533 started flying combat missions and three weeks later became the first squadron at Nam Phong to lose an aircraft. On 7 July, 1972, pilot Captain Len Robertson and bombardier-navigator First Lieutenant Alan Kroboth attacked an NVA bullets and beans storage site south of the DMZ near Khe Sahn. While pulling off target following release of bombs on the first run, the A-6 was hit by AAA in the starboard wing. The A-6 was engulfed in flames and became uncontrollable. 1/Lt Alan Kroboth ejected successfully but was severely injured during his departure from the Intruder and parachute landing in enemy controlled territory. Alan was captured soon after hitting the ground. 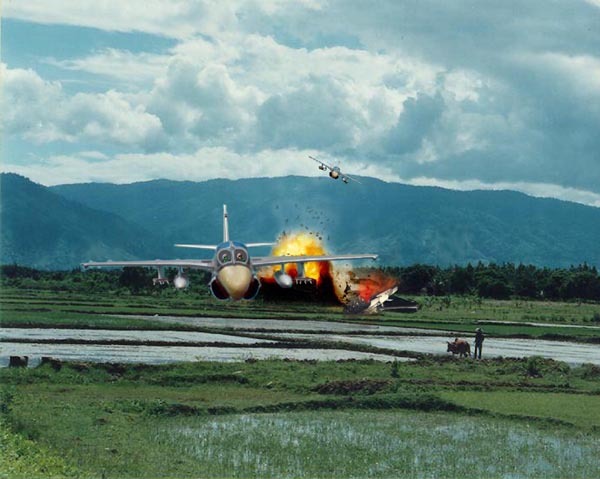 The North Vietnamese Army soldiers later told the injured Alan Kroboth that his other crew member, Captain Leonard Robertson, was killed in the impact of the A-6 with the ground. 1/Lt Alan Kroboth suffered terribly during the shootdown and capture but endured even more terrible treatment during his long trip from the DMZ to Hanoi, North Vietnam. Alan joined 500 other American prisoners of war in the dreaded, so-called, Hanoi Hilton prison. Alan was released on 27 March 1973, during the massive repatriation of American POWs by North Vietnam following cessation of conflict between the United States and North Vietnam after signing of the Paris Peace Accords. Alan Kroboth is a live American Hero. He was an outstanding Bombardier-Navigator and a dedicated courageous Marine. Alan flew in my aircraft and operated the complicated technical armament and navigation systems as though he was born in the right seat of an A-6 Intruder. Thanks Alan, for your distinguished military service, your personal sacrifices and your great contributions to our beloved United States that significantly protected the freedoms all Americans enjoy. Captain Leonard Robertson flew on my wing on numerous occasions. He was a loyal Marine, a fine officer and leader and a superior Naval Aviator who set high standards of moral character, appearance, dignity and gentlemanly virtues. Lenny was an exceptional young patriot. He gave his life for his Country. The irony of the Captain Len Robertson story is that had he held steadfast in his resolve to not drop a nuclear weapon he would have been taken off flying status and would not have been flying the conventional bomb delivery on July 7, 1972. To think, if Lenny had persisted in his decision to not agree to drop a nuclear weapon, he would not have been killed in the NVA shoot-down of an A-6 Intruder flying out of the Rose Garden. Captain Leonard Roberson died a Hero. Len Robertson has not been forgotten. His ultimate sacrifice for his Nation will live in history. Thank you Lenny! Rest in peace at that lofty Aerie that awaits all faithful Warrior Aviators. Declared 'died while missing' on December 8, 1978. ~"RIP Warrior! Hand Salute! ..... Two!